The Great Recession may be over, but every night people are sleeping on benches or in makeshift shelters. Here are a few of their stories. David Bacon A homeless woman on a bus bench on Broadway got a bag of food and a blanket from Vinny Pannizzo. David Bacon Bill Davidson and Ebony built a shelter near the freeway on Brush Street. 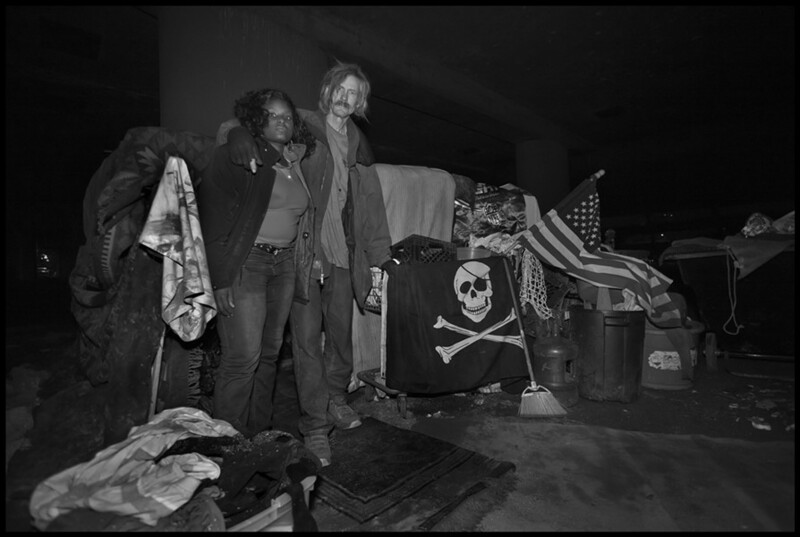 David Bacon Shawana Benson lives in a tent in a camp beside the freeway, surrounded by the bottles of juice and other belongings she was able to save from Caltrans. 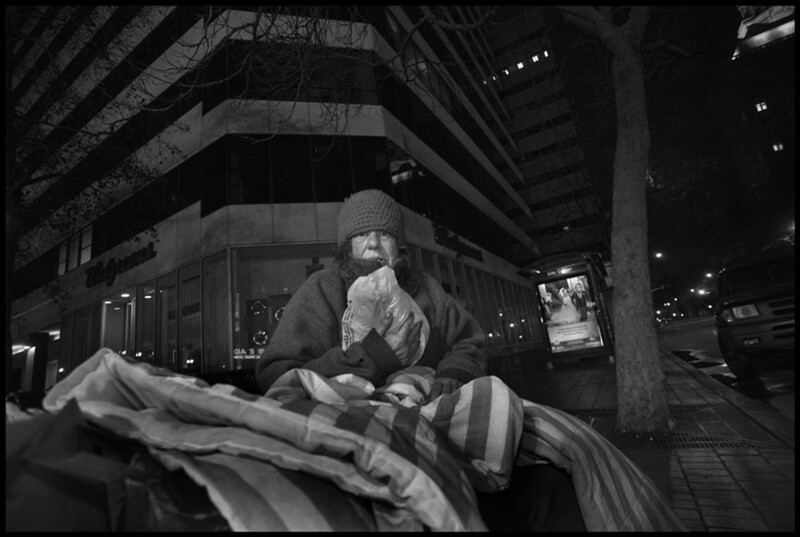 David Bacon After fifteen years of helping homeless people, Pannizzo can't understand why there are now more hungry people than ever. 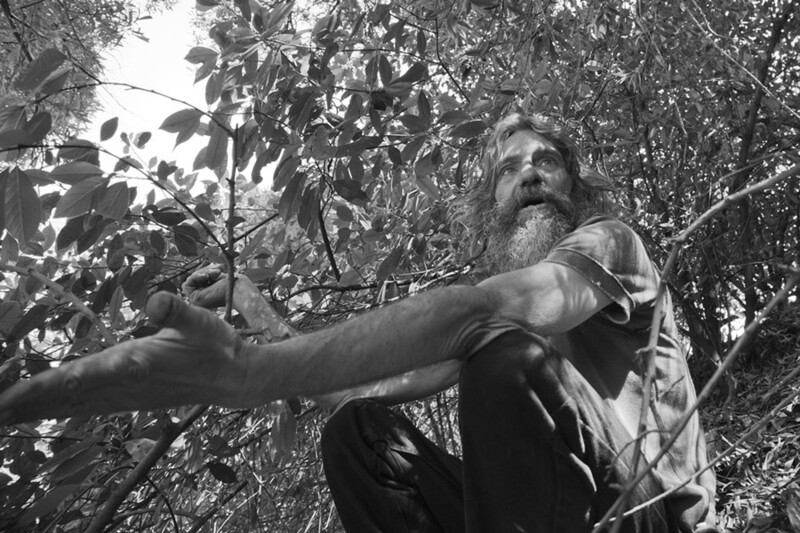 David Bacon Sitting in the bushes on a hillside above a freeway onramp, Joe Mazarek said he likes talking to people, but that his long hair and beard sometimes puts them off. 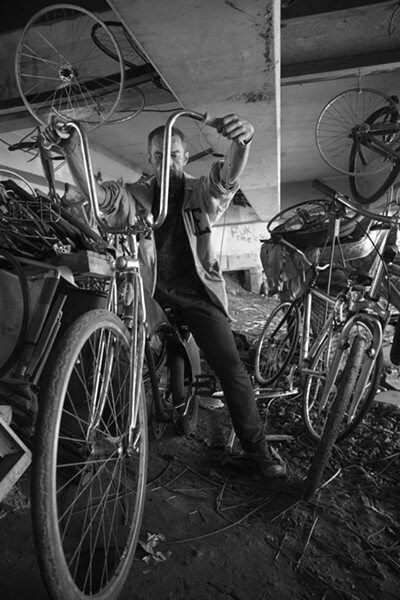 David Bacon Jeremy White fixes bicycles and he stores bikes for homeless people who have nowhere to keep them from being stolen or confiscated by Caltrans. This report won a first-place award for best photo series in the 38th Greater Bay Area Journalism Awards contest. Before I went out with Pannizzo on his rounds, we sat in the old van he uses to distribute his food. 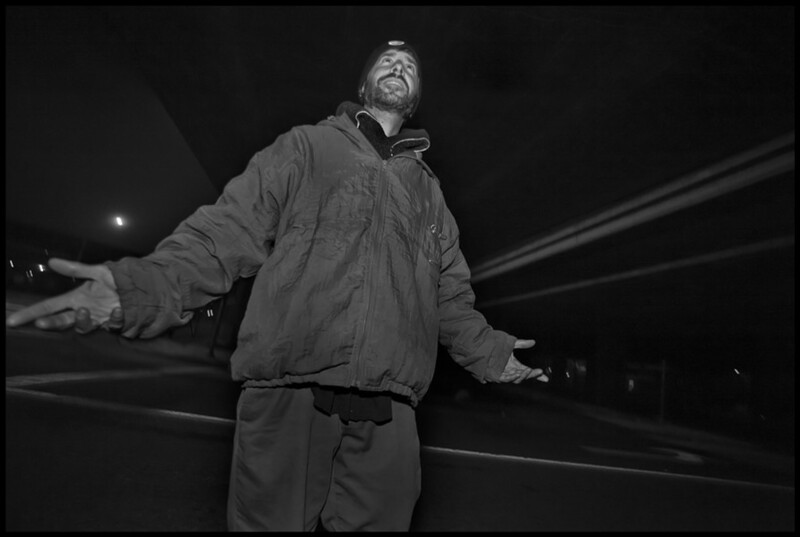 He explained to me what led him to spend the last fifteen years driving through the streets every night, handing out food and blankets to people sleeping on bus benches and in homeless camps. I had a wonderful childhood. But I never really took life seriously until I became an adult and went to college. I became rather cloistered, devoted to my studies, first at Rutgers and then at Berkeley. I approached the Bible with an academic understanding initially. On an historical level, on a literary level, and then on the level of prophecy. I began to study the Dead Sea Scrolls, and I became obsessed. Certain passages leapt out at me. I felt suddenly enlightened. It happened rapidly. I knew it had to be true, and I couldn't avoid it. There was no turning to the left or to the right. I had no choice but to make every effort to get to know God. He put a spirit in me and he wouldn't let go. I began to neglect my studies. It was frightening. I'd find myself reading the scriptures and looking over at the corner of the room and the pile of books I needed to hit to continue the daunting workload I had in graduate school. Neglecting it more and more to read the Bible. And eventually I just dropped out. My new monkish existence was very different, because it required me to go into the field, to visit the needy, the marginalized, the despised. I was reading Luke Chapter 6, and Jesus says there to give to everyone who asks. I was still uncertain whether it was all real or not. But I decided to be obedient to it, and I went out and started giving to everyone who asked me. Every single person. I gave money, straight up. I'd run out of money from time to time. I'd look between cushions on the couch for change so I could go get a cup of coffee, hoping that no one would ask me for money before I got it. It was the beginning of real faith, of surrendering myself completely. That was the most difficult. I was renting a room in a little house on Channing Way in Berkeley. I knew that if I start giving my money away, I wouldn't have any to pay my rent. I did lose that room, so I had to beat it. I went back to New Jersey and got married, and came back out to California. My wife and I decided to move into an apartment, with the idea that we were going to serve God together. She didn't have the same ideas about giving everything away, but she went along with the program. She was a trooper. We began getting kicked out of apartments for housing homeless people. We would take people right off the streets. Women with crack babies. Alcoholics. I felt guilty paying rent somewhere, and sleeping in a warm bed, when there were others on the street, right outside my apartment. The spirit of God within me wouldn't allow it. That was a tremendous source of tension with my wife, and it escalated. I tried to convince her to surrender more of our money, more of our time, more of our living space. She really hung in there for a long time, but it was not fun. Those were some troubling times. We're not together anymore, but I love her. She's a wonderful human being — caring, very loving, and strong. I'm living on the streets now. I've been homeless for over ten years. But I never expected to have anything in serving God. It's not about living comfortably in this world. 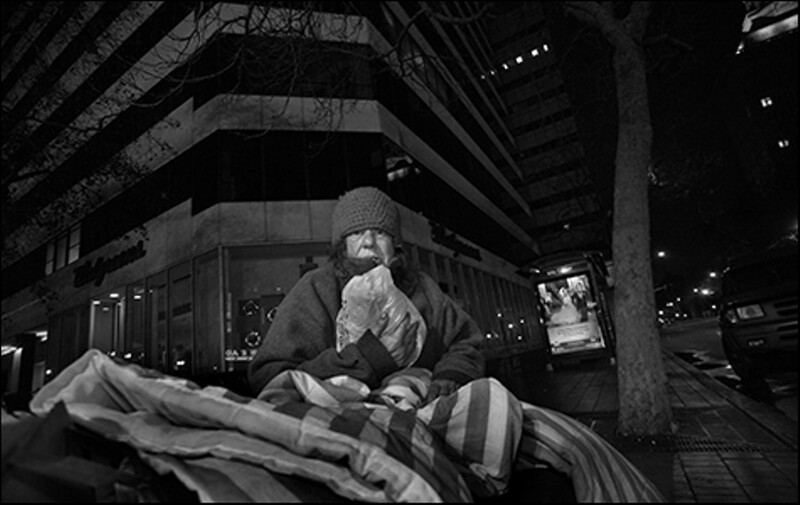 It didn't make it any easier to become homeless — it was still a very frightening experience. Wringing of hands. Wandering the streets. My time in the army, as a paratrooper enduring the cold, the rain and the mud, actually helped prepare me for being homeless. I didn't know if I'd lost my mind at first, but there was that small voice of God, saying hold on. My revelation was a matter of intellect, rather than gut feeling — that the words of Jesus are true, and to hold onto them. I did, and they got me through the first few years of homelessness, which were difficult indeed. A day does not go by that I don't want to quit, when I'm overcome with feelings of despair. I've put all my eggs in one basket and that is Jesus. He sees me through everything and gives me strength that I didn't know existed. But it's draining. It's exhausting. It is. I work every day. I do carpentry. I paint. I do tile. I'll even do yard work. The food I distribute comes from donations, from bakeries, the Salvation Army, and the Alameda County Food Bank. People help me do the collection, and Jeffrey, who does the accounting, started up a nonprofit organization for me. We receive donations from that. I live in a camp on the side of the freeway. I've been kicked around from camp to camp by Caltrans for years — my own personal diaspora. Many times I've had a camp full of feeble people, old people, people with dementia. Think of how hard it is to march everyone to a different camp, with all of their bedding and belongings in shopping carts. So I form an advance party, and clear out a space somewhere along the freeway. We all move in together, like a family. Sometimes we move back into the same camp, if the police aren't involved. Many homeless people do that.